You need a subscription to Microsoft Azure. If your team has an organizational subscription, ask the owner to add your Microsoft Account to it. Add the loader code snippet to your web pages, as follows. 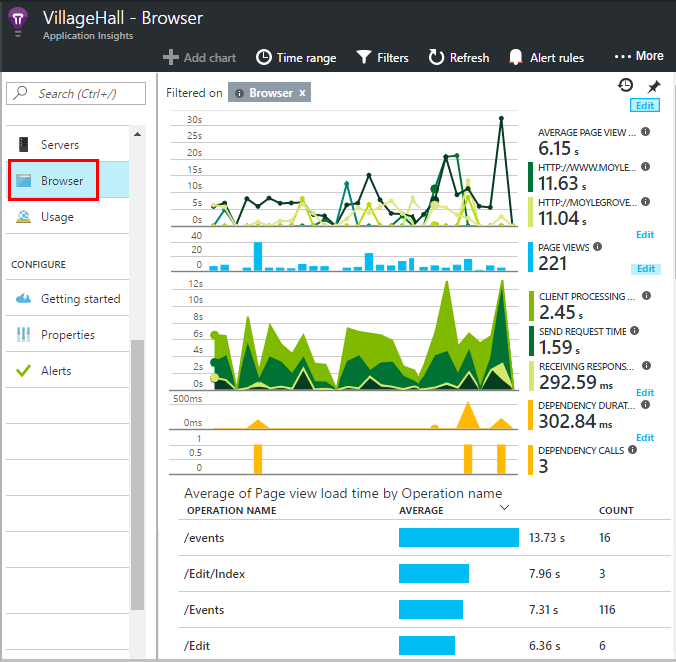 The Application Insights resource is where data about your page's performance and usage is displayed. Questions already? More about creating a resource. In a SharePoint site, on the control panel, open Site Settings / Master Page. 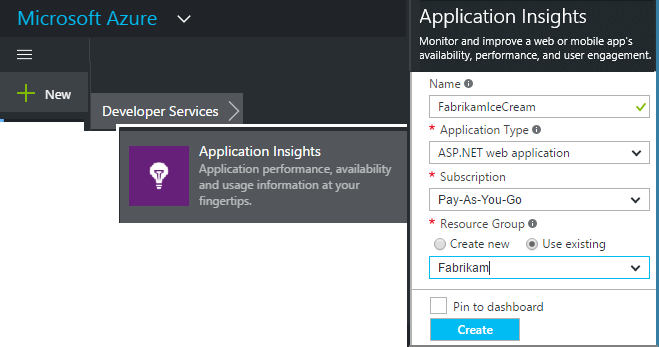 The script contains the instrumentation key that directs the data to your Application Insights resource. There are several parameters you can set, though in most cases, you shouldn't need to. For example, you can disable or limit the number of Ajax calls reported per page view (to reduce traffic). Or you can set debug mode to have telemetry move rapidly through the pipeline without being batched. // Send telemetry immediately without batching. // can affect browser performance. // Don't log browser exceptions. // Don't log ajax calls. // Limit number of Ajax calls logged, to reduce traffic. // Time page load up to execution of first trackPageView(). // Set dynamically for an authenticated user. Run your web app, use it a while to generate telemetry, and wait a few seconds. You can either run it using the F5 key on your development machine, or publish it and let users play with it. If you want to check the telemetry that a web app is sending to Application Insights, use your browser's debugging tools (F12 on many browsers). 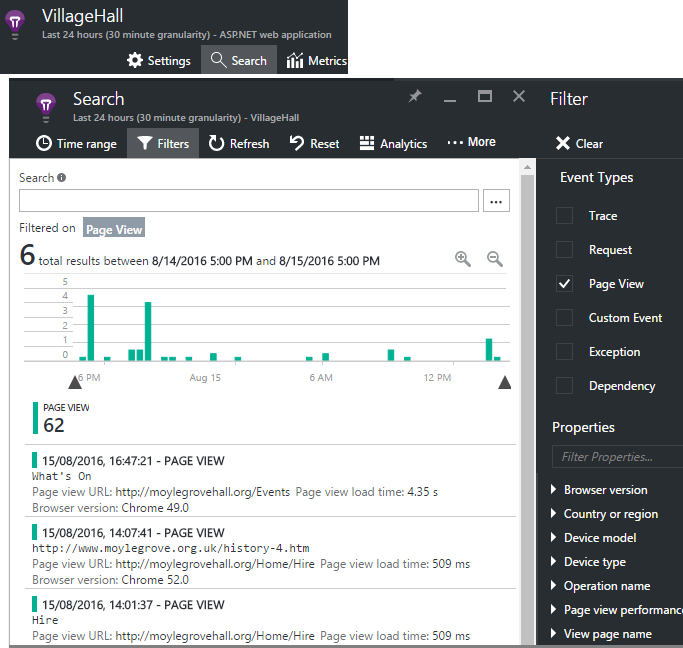 Data is sent to dc.services.visualstudio.com. 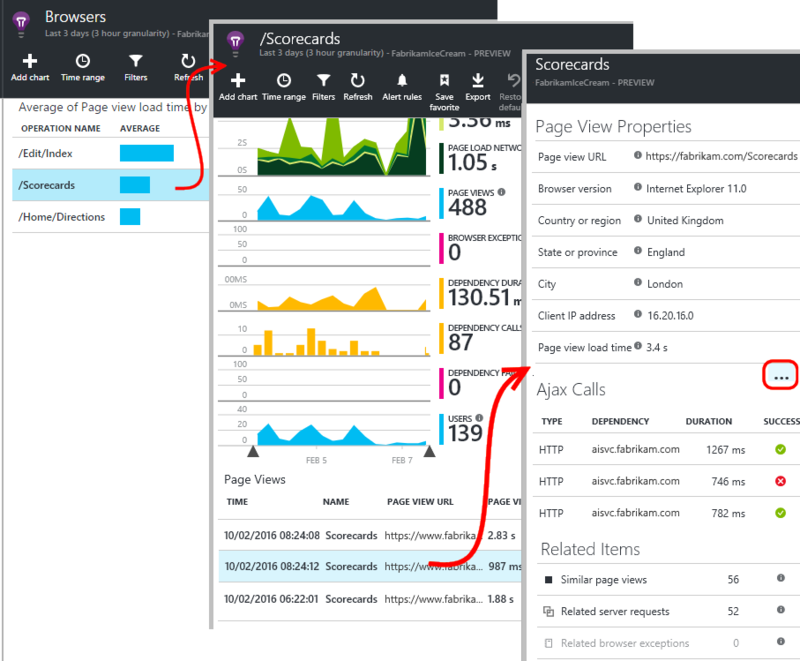 Open the Browser blade to show aggregated performance data from your users' browsers. No data yet? Click Refresh at the top of the page. Still nothing? See Troubleshooting. The Browser blade is a Metrics Explorer blade with preset filters and chart selections. You can edit the time range, filters, and chart configuration if you want, and save the result as a favorite. Click Restore defaults to get back to the original blade configuration. 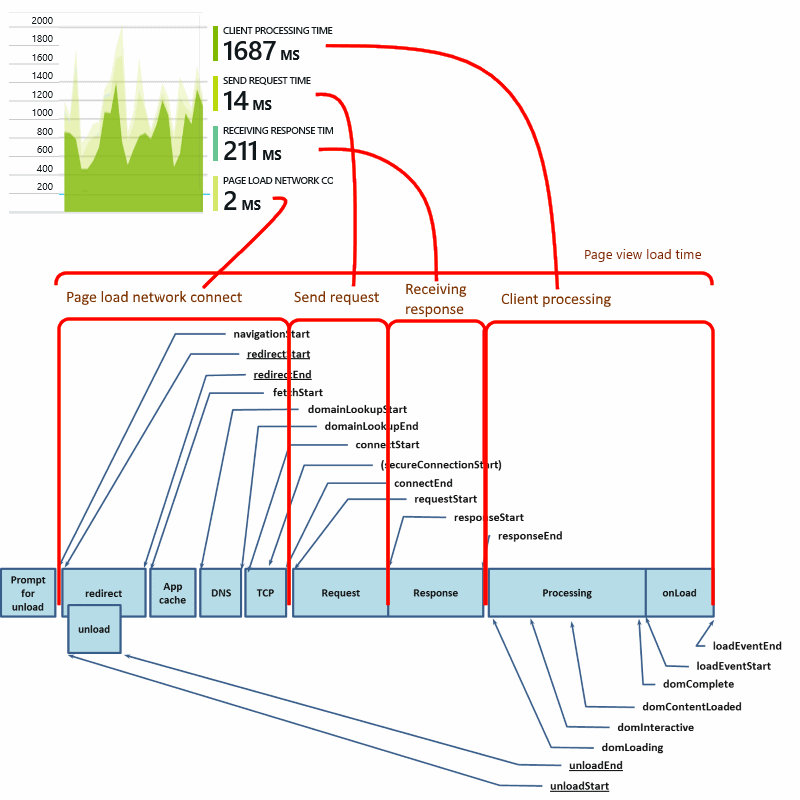 At the top is a segmented chart of page load times. The total height of the chart represents the average time to load and display pages from your app in your users' browsers. The time is measured from when the browser sends the initial HTTP request until all synchronous load events have been processed, including layout and running scripts. It doesn't include asynchronous tasks such as loading web parts from AJAX calls. The chart segments the total page load time into the standard timings defined by W3C. Note that the network connect time is often lower than you might expect, because it's an average over all requests from the browser to the server. Many individual requests have a connect time of 0 because there is already an active connection to the server. Slow page loads are a major source of dissatisfaction for your users. If the chart indicates slow page loads, it's easy to do some diagnostic research. Notice the page view count and standard deviation. If the page count is very low, then the issue isn't affecting users much. A high standard deviation (comparable to the average itself) indicates a lot of variation between individual measurements. Zoom in on one URL and one page view. Click any page name to see a blade of browser charts filtered just to that URL; and then on an instance of a page view. 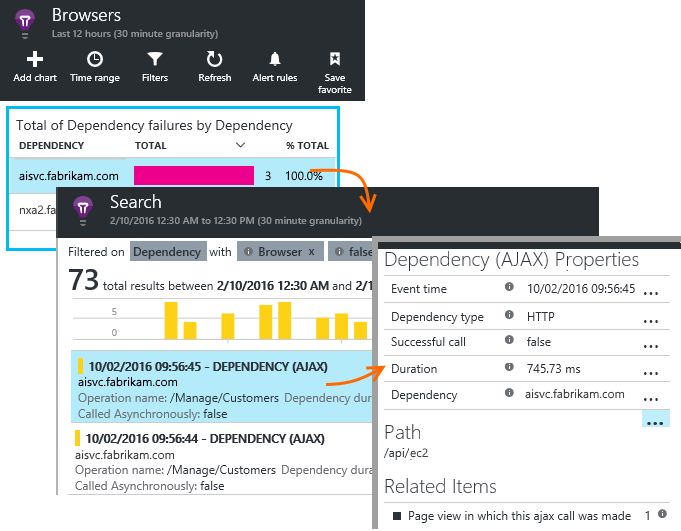 Click ... for a full list of properties for that event, or inspect the Ajax calls and related events. Slow Ajax calls affect the overall page load time if they are synchronous. Related events include server requests for the same URL (if you've set up Application Insights on your web server). Segment by other dimensions. Maybe your pages are slower to load on a particular browser, client OS, or user locality? Add a new chart and experiment with the Group-by dimension. Make sure any AJAX calls in your web pages are performing well. They are often used to fill parts of your page asynchronously. Although the overall page might load promptly, your users could be frustrated by staring at blank web parts, waiting for data to appear in them. AJAX calls made from your web page are shown on the Browsers blade as dependencies. Click any row for specific details. If you delete the Browsers filter on the blade, both server and AJAX dependencies are included in these charts. Click Restore Defaults to reconfigure the filter. To drill into failed Ajax calls scroll down to the Dependency failures grid, and then click a row to see specific instances. Click ... for the full telemetry for an Ajax call. Ajax calls include any HTTP/HTTPS calls made from the script of your web page. If you don't see them reported, check that the code snippet doesn't set the disableAjaxTracking or maxAjaxCallsPerView parameters. On the Browsers blade, there's an exceptions summary chart, and a grid of exception types further down the blade. 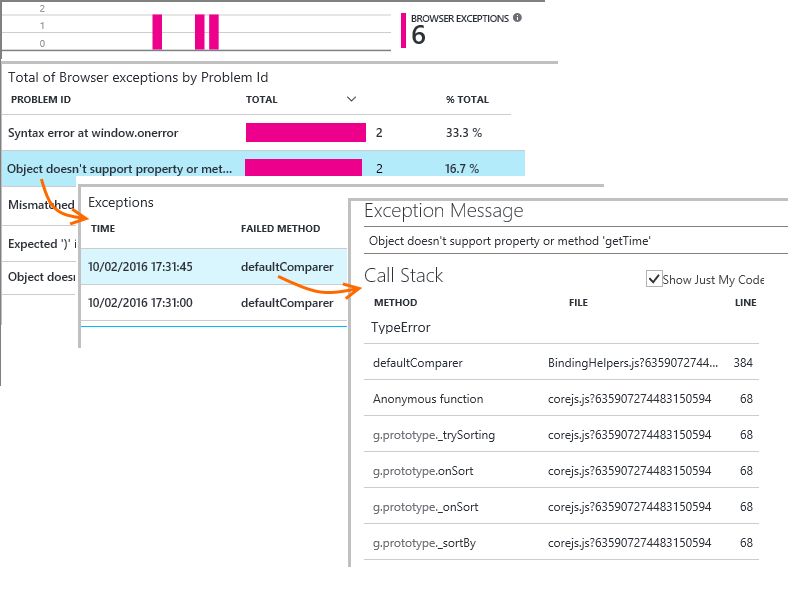 If you don't see browser exceptions reported, check that the code snippet doesn't set the disableExceptionTracking parameter. Usually page view telemetry is analyzed by Application Insights and you see only cumulative reports, averaged over all your users. But for debugging purposes, you can also look at individual page view events. In the Diagnostic Search blade, set Filters to Page View. Select any event to see more detail. In the details page, click "..." to see even more detail. If you use Search, notice that you have to match whole words: "Abou" and "bout" do not match "About". You can also use the powerful Log Analytics query language to search page views. By default, the time it takes to load the page, from client request to full load (including auxiliary files but excluding asynchronous tasks such as Ajax calls). If you set overridePageViewDuration in the page configuration, the interval between client request to execution of the first trackPageView. If you moved trackPageView from its usual position after the initialization of the script, it will reflect a different value. If overridePageViewDuration is set and a duration argument is provided in the trackPageView() call, then the argument value is used instead. The page name can contain the same characters as a URL, but anything after "#" or "?" is ignored. Want to find out what your users do with your app? Learn about custom events and metrics API.